There are two other important differences between total GDP and how prosperous consumers feel. The first is how GDP is distributed between wages, profits and taxes. The chart below shows the shares of these three items (plus an ‘other’ category that includes self-employment income) over the same period. The top line is the share of ‘wages’ (compensation of employees) in GDP. Movements have not been dramatic, but this share is now lower than in 2007. A major reason for this is straightforward: higher indirect taxes. VAT was reduced in 2009, but restored in 2010, and raised again in 2011. Austerity has played a part in reducing real incomes. You might think another factor is changes in direct taxes and benefits, but as this recent post showed, cuts in taxes have largely offset cuts in benefits on average (but not for those in the lower quarter of the income distribution). The second important factor is what economists call the terms of trade. We buy many overseas goods, so if their price has been rising relative to the price of goods produced in the UK, we will feel poorer. Here the major change occurred in 2008, with the large depreciation in sterling, although higher commodity prices will also have had an impact. Real earnings were over 8% lower in 2014Q2 compared to their average in 2007. This overstates how much poorer we are on average for various reasons, but poorer we certainly are. 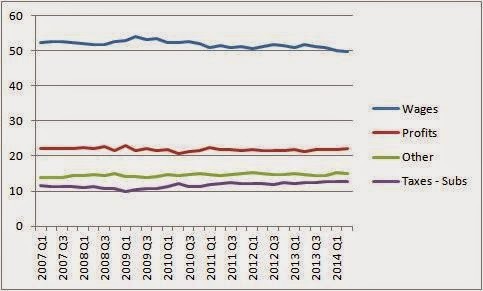 Real disposable income per head was about 2.5% lower in 2013 than 2007. Consumption per head in 2013 was also substantially lower than in 2007, and also lower than it was in 2005 and 2006. And if you think that was because 2007 was a debt fuelled consumer boom, think again. 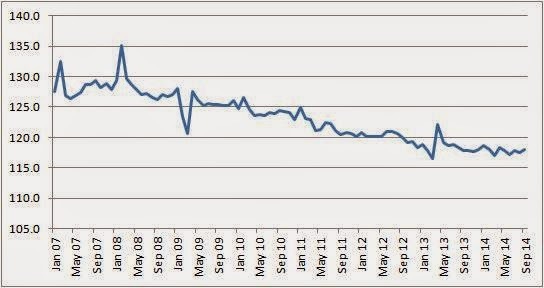 In fact, according to the latest data from the ONS, the savings ratio in 2013 was a little below its level in 2007. So although GDP may be higher than before the recession, when we take account of the fact that there are more people in the UK, government takes more in indirect taxes, and import prices have risen much faster than the price of UK output, we end up significantly poorer. This post in complimentary to this interesting Chris Giles article in the FT.
 GDP is in £ million, 2011 prices. If you type ‘ONS UK GDP per capita’ into Google, you go straight to the (new?) Economic Time Series page on the ONS site - just scroll down for these series. (Alternatively go to the ONS site, select ‘browse by theme - Economy’ and the link is at the bottom right.) Most of the data in this post can be found there. I do have a request though - can we have the index numbers for the average earnings data there too please, with annual and quarterly averages as well as monthly? More generally, anyone can derive percentage changes from a levels series, but you cannot do the reverse accurately. Blue book chapter 1, table 1.5. I will expect to see this data discussed by journalists in the upcoming election campaign. I think there should be a campaign to flatten the Laffer curve and you’re the man to lead it. It would seek international cooperation to limit tax avoidance and tax competition, particularly for rich people and in/between rich countries. What do you reckon? Can we count on you? It doesn't make any sense to put GDP on a linear scale. The market system is founded on GDP growth. So the only way to show how the economy is growing is with a logarithmic vertical axis against a trend line. 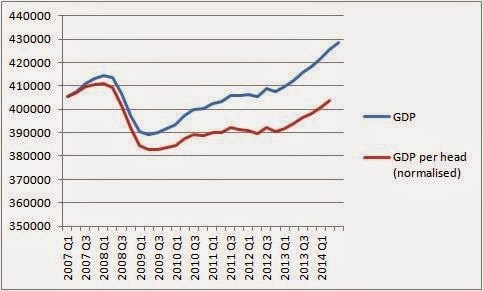 The lackluster 3.2% growth the UK will have in 2014 will recover GDP that was LOST since 2008. But it doesn't show how far behind the country has fallen with its boneheaded "expansionary austerity." We now see real median incomes taking another big hit because of the 2008 economic collapse and resulting Great Recession. So the immoral of the disinflation story: big recessions will significantly lower inflation and real incomes whether it's the central bank's intention/desire or not. From 1947 to 1973, US real male median incomes (age 25-34) grew at 2.9% annually to a height of $47.3k in 2013 dollars. They are now $34.2k, or lower than they were in 1961. Of course this time-travelling income regression does not take personal and government debts with it, which are at very high levels and increasing. Eventually people will have to stop borrowing and start paying down debt. This deleveraging shock will cause another recession and a deeper hit to real incomes in a downward spiral. So it looks like the monetarist ideologues have created an inflation-busting Frankenstein that is lumbering amok. Wonder how long it will take them to figure it out? and implicitly for other matters of heft in real-politik. But I find that somewhat misleading, because there is a much better "sell-side" reason why GDP rather than GDP/capita (or per adult etc.) features prominently in public discourse. Most business and economic news and analysis are from the point of view of *investors*, and GDP growth, not so much GDP/capita growth, drives the valuations of stocks and other assets. Indeed a good argument could be made that a decrease in GDP/capita together with an increase with total GDP would push up stock and asset prices more than if both grew together: that decreasing GDP/capita means lower wages, while increasing total GDP means a bigger market and more workers, both resulting in higher rents and profits and thus higher asset prices. I was impressed by the suggestion In a paper I recently read on economic performance of the UK between 1997-2010 that looking at GDP per adult is an even better measure of the fortunes of people in the economy. I would think that GDP per non-retired adult or even just GDP per prime working-age person 25-55 adult might be also a good metric. In the UK it would also give a better hint on the contribution of immigrants and illegal/unregistered immigrants in particular. Shouldn't one also look at how the growth distributed *between people*? If for example 1% of people are appropriating 100% (or more) of the growth, you wouldn't expect people to feel better off even if the economy had doubled in size.